Once again I’m handing the podcast over to you, our listeners, to tell your stories and tips of starting and growing your blogs. In today’s episode you’ll hear the story of Robert Farrington, a finance blogger. After a couple of fairly unfocused years where he made no money from his blog, Robert managed to turn things around through storytelling and taking his readers on a journey. In his third year he made $30,000, and today he earns a high seven-figure income from his blogging business, with more than a million people reading his blog every month. I love that how the bloggers in the series who’ve ‘made it’ to a full-time level are giving us insights into their early years. This series is designed to give those starting out (or about to start out) some inspiration, along with some practical tips and encouragement for those early days. Darren : Hey there and welcome to episode 224 of the ProBlogger podcast. My name is Darren Rowse and I’m the blogger behind problogger.com. A blog, podcast, event, job board, series of ebooks, and courses, all designed to help you as a blogger to grow your audience, to create some great content, to build community and monetize your blog. You can learn more about ProBlogger over at problogger.com. In today’s episode, we’re continuing our series of blogger stories where I am handing the podcast to you as listeners of this podcast and the readers of the blog. To tell you stories, to share you tips of starting and growing your blog over these 12 episodes and they’re daily at the moment so they’re coming thick and fast. You’re hearing stories of bloggers who started out, some of them a few years ago and some of them 10 years ago now to tell us some of what has happened since for them. They talk about their mistakes, their tips, the lessons they’ve learned and the good things that have come as a result of starting their blog. Today, you’re gonna hear the story of a finance blogger who started a few years ago now and it was a fairly lean start. He pushed through a couple of fairly unfocused years where he didn’t really have focus for his blog, where he wasn’t really making any money at all from his blog, but he pushed through it anyway to the point where in his third year, he began to get it together. In that third year, he made about $30,000 which was the beginnings of a new business that formed around his blog. Today, he has over a million readers a month and he’s making high six-figures a year from that blog. I’m not guaranteeing that if you take our Starter Blog course that you are going to get to that point, but really, this series is about giving you a little bit of inspiration, to tell you some stories of what could happen as a result of starting a blog, but also to give you some practical tips, and to give an insight into the beginning days of these blogs. One of the things I love about this series is that we are hearing from bloggers who have, to all intents and purposes, made it. They’re at a full time level, they’ve built successful businesses but they’re giving us little insights into their early years. I love that and I’m very grateful to all these bloggers who are doing that. This series is designed to give you, as a someone who’s potentially starting out in your blogging journey, or someone who’s about to start out in your journey, some inspiration but also those practical tips and some encouragement to get through those early days, to push through those days where you might feel things are a little bit unfocused, or you might feel things aren’t really reaching their potential. This series is a part of our launch of a brand new Start a Blog course which is launching in the second week of January. You can learn more about that over at problogger.com/startablog. If you give us your email address there, we will let you know when that course goes live. Today’s show notes with links to that Start a Blog course and a full transcript of the show today as well as links to our blogger of the day. You can find those show notes over at problogger.com/podcast/224. Today’s blogger is Robert Farrington. I met Robert recently over at the FinCon conference and he is the blogger behind thecollegeinvestor.com. As it might sound, it’s a finance blog, someone who is focused particularly on those people in their young adult years, student loans, those type of things, but trying to help those younger people never get through some of the decisions they need to make. I’m gonna let Robert tell his story and then I will come back at the end to share a few of my thoughts on the story that he shares and some of the tips that he gives. Well-worth a listen, I’ll chat to you at the end of his story. Robert: Hi there! 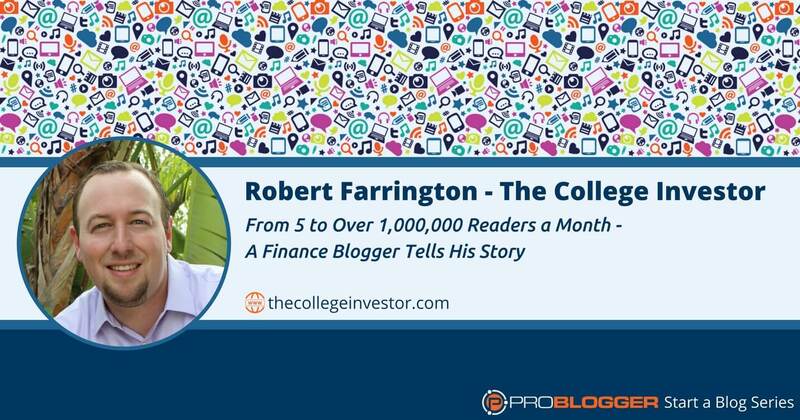 My name is Robert Farrington and I am the founder of The College Investor and it’s at thecollegeinvestor.com. It is a blog all about personal finance for young adults. We talk about getting out of student loan debt, starting to invest, and building wealth for the future. I started this blog because I am passionate about investing. I was that guy in the back of my college class, on the internet, watching stocks, and really just wanted to share my insights about investing. This was all the way back in September of 2009. I’ve been doing this for about eight years now. It’s pretty crazy to think about because, when I started, it was completely a personal blog. I really just shared my thoughts and my opinions, and you know what happened as a result? Nothing. Nothing happened. I probably had five visitors a day, everyday, for the first six months that I started this blog. But, you know what? I really enjoyed writing. I really enjoyed sharing my thoughts. I really enjoyed the technology of it. I find it interesting how you can put things together and build a WordPress site and all that type of stuff. Honestly, that’s how I started. It’s crazy to think about because, when I started, really, I just wanted to educate people. My goal, my dream was just share my knowledge. But you know, my friends were telling me, they were like, “Robert, that’s great knowledge. I love the idea of investing but I have all this debt, and I have all this other stuff going on in my personal and financial life that I really just can’t do that right now.” I started to realize that while sharing my thoughts are great, it was really important to also help my readers with their questions, and their comments, and their concerns.. While I have my own opinions about things and I can inject that, if I am not helping others answer their question, I can’t ever get them where I want them to be. That’s really what I started to transform my blog and it took about a year or two. Around the same time, about the two-year mark, is also when I started connecting with other bloggers. Honestly, when I started, I was in my silo. I didn’t really talk to anyone else. I didn’t really comment on other blogs. I didn’t really reach out to anyone and just hi. I just did my own thing. That was really disadvantageous to me. It really held me back. When I started connecting with others, and I started learning, and I started seeing what other people were doing, and getting some tips and getting some tricks, and getting some help from others. And then, I also started changing my messaging to help my readers more, to share my thoughts, but do it in a way that takes my readers and guides them and holds their hand through it. That’s what I really started to see some traction on my site. Honestly, my site started going from no readers a month, to a couple hundred readers a month, to a couple hundred readers a day. It started getting some revenues well. I made zero money my first two years. Finally, in about year three, I think I was making about $30,000 a year. Getting it up there to $2000 or $3000 a month which was great money considering that I really was just writing stuff on the internet. If I had to go back in time, what would I say to avoid, and what should you have to do? Well, you have to network with others. You have to connect with your community. Whatever your niche is, connect with them, and at the same time, you need to always remember your readers and you need to take your readers on a journey with story and with education, lead them down the path. Finally, you have to have the best content out there. Because especially in a space like personal finance, there’s only about six or seven topics you can write about. You can write about budgeting, investing, getting out of debt, credit cards, whatever. It’s the same stuff over, and over, and over again. What makes things unique and what makes thing different is the stories that you can tell and the path that you could take people on, and making sure that you have the best content possible out there. I’ve been doing this and focusing on this now for eight years. But my last two years, I really haven’t created a lot of new content. What I have been doing is going back and picking out my gems in my archives and updating them, making them the best. Creating that story around them and resharing them. I can tell you now that after doing this for eight years, we get almost a million visitors a month on the website, we’re making really good money. It’s gonna be a high six-figure to seven-figure blog. The opportunities in income continue to grow because we continue to focus on our readers, networking with others, and writing the best things out there on the topic that really could stand on its own. Hopefully that helps you get started with your blog. Darren: Thanks so much, Robert, from thecollegeinvestor.com. Really appreciated you sharing your story today. I was really pleased when I saw Robert’s audio come in because I had bumped into him several times at the FinCon conference. He was someone who was networking incredibly. He was actually one of those people I just kept bumping into. He seemed to be really well connected. He has actually lived out that tip that he gave in his story today. I find it interesting today to hear the similarities in Erin’s story from yesterday’s story. Robert started out because he was excited to share on a particular topic. This is that common thread that I hear from many full time bloggers today. I think it’s the case for a few reasons, people who start out just genuinely wanting to talk about a particular topic tend to do quite well, at least a lot of the full time bloggers do start that way. I think it’s because when you start out passionate about your topic, genuinely excited about sharing what you know, it comes across in your writing. People can sense that in your writing. When you bring energy and enthusiasm and excitement to your topic, it’s gonna shine through. It will also shine through in the way that you go about promoting your blog, in the way that you network with other people. It’s a very attractive thing. It’s also gonna help you through the lean times. You heard Robert there talking about those first couple of years of what did he say there? Five visitors a day for the first six months? That’s not much in terms of readers. That could be the period where you might, if you didn’t have genuine enthusiasm for your topic, say, “This is too hard. I’m not gonna keep going.” But if you bring enthusiasm to your topic, you genuinely just like to talk about it, then you’re gonna be able to get through those times more easily. I also love what he talked about focus and bringing more focus to his blog. His blogging in the early days was just his thoughts. It was all centered around what he was thinking. But, a shift to begin to think about his readers and to put them front and center, their questions, their problems. That simple shift and re-focusing less on his thoughts and more on his readers. Still able to bring his thoughts but from the perspective of what do his readers want to know, what do they need to know, what are their questions. Less about him, more about his readers, that was certainly a key thing there. Then of course, as he talked about that he’d been operating in a silo, and the realization that he could learn a lot more about blogging, and he can grow his blog a lot faster if he began to network. Look at what others were doing and connect with others within his niche. Really, the sense I get is it was those two shifts from being an [00:12:21] blogger that was all about him and his thoughts to being more focused upon his readers and his niche seemed to really unlock things for him. I was also fascinated there about what he said about the last two years writing less new content and picking out the gems and updating his archives. Whilst that may not be relevant to those of you who are starting a blog, because in the early days you really do need to build up your archives. If you’ve been blogging for a while, I think, this is a really important thing to do is to pay attention to those archives. This is something that I’ve been hearing over the last year or so particularly at FinCom, conference that I mentioned earlier. I met a lot of bloggers who had really pulled back on the amount of new content that they’ve been writing. They really were re-optimizing the gems in their archives, the posts that were already ranking in Google actually taking them to the next level. Optimizing them, improving the content, making them more visually pleasing, adding further reading, making them deeper content, actually improving that content was paying off more than creating new content for them. Again, that’s something for those of you who’ve been blogging for a while now. You might have some archives. I think that’s a brilliant tip and something that we’ve been doing a little bit more of over the last six months as well on both of my blogs. I hope you’ve got some value out of hearing Robert’s story today. I think it’s a great one. Again, you can get a full transcript of Robert’s story and find his blog over on today’s show notes at problogger.com/podcast/224. Tomorrow, another story for you. We’ve done five or four so far this week. I do encourage you to go back and listen to the last four or three episodes if you haven’t listened to those already. I’ve got one more coming for you tomorrow and then we’re gonna have a week off because it will be Christmas. Hopefully, in those last five or so episodes, there’ll be enough there for you to listen to. We’ll come back on the 1st of January with five more in a row and a couple more before we launch our Start a Blog course. Again, if you are interested in starting a blog, check out problogger.com/startablog. Let us know your email address and we’ll let you know when that course goes live. Thanks for listening, chat with you tomorrow in episode 225. The post 224: From 5 to Over 1,000,000 Readers a Month – A Finance Blogger Tells His Story appeared first on ProBlogger.